Guests at the Reflections Holiday Park at Seal Rocks can now enjoy a seamless experience with no power outages thanks to the installation of a $115,000 backup generator last month. CEO Steve Edmonds said installation of the 165kva generator would improve the guest experience while maintaining the eco-friendly environment Seal Rocks is renowned for. “When you lose power, you lose the ability to communicate with guests to advise them of what is happening in and around the park,” Mr Edmonds said. “The park’s new generator allows us to maintain a high standard of communication during an event via the use of our newly-installed Wi-Fi system. “Our guests’ safety is a priority and we are pleased that our safety has improved with the installation of this generator. “This particular generator and wiring system also enables us to pursue future expansion into solar power, which aligns with our strategic plan of protecting the environment. The Kohler 165kva generator has automatic switching functionality and was sourced from engineering group, Kent Electrical based in Maitland NSW. 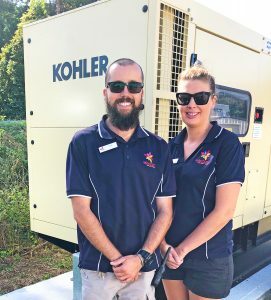 Park Managers Edward and Justine Syme said they were thrilled to have their new permanent generator equipped to sustain the park at full operation. Park regulars Jim and Diana from Merewether NSW stayed at Seal Rocks last month when there was a day-long power outage and said it was great to still have power at that time. The installation of the $115,000 backup generator comes on the heels of recent Wi-Fi infrastructure upgrades at the park late last year. “Previously Seal Rocks had very little mobile coverage which inconvenienced guests who wanted to communicate with friends and family during their holidays,” Mr Edmonds said. To book an inspiring stay at Reflections Holiday Park Seal Rocks visit www.reflectionsholidayparks.com.au.